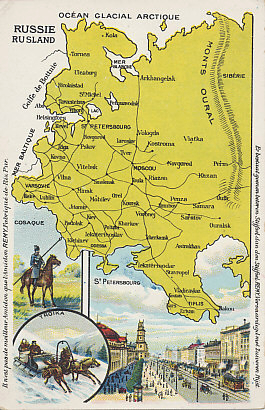 Advertising postcard map of European Russia, with inset images of a mounted Cossack lancer, a troika, and St. Petersburg. Archangel, Russia, is located on the Northern Dvina River, near its outlet to the White Sea, an extension of the Barents Sea, part of the Arctic Ocean. Turkey's entry into the war closed Russia's Black Sea ports to Russian trade, and Russia's Baltic Fleet was no match for Germany's, leaving Archangel and Vladivostok on Russia's Pacific coast as Russia's ports for international trade. Archangel was however, icebound in winter. Although Allies could provide supplies, rail transport to the south was limited. To reach Archangel, a ship passed along the Norwegian coast, north of Norway through the Norwegian Sea to the Barents Sea. It was on such a journey that Herbert Lord Kitchener lost his life when his ship hit a mine. 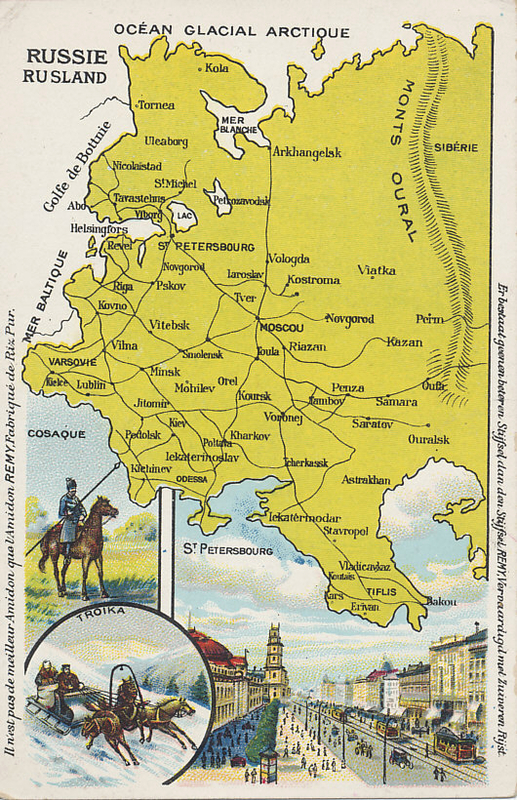 Archangel was one of the principal ports used by the Allies in their anti-Bolshevik campaign. Archangel, Russia is a city in Russia.